Another collaborative Anchor volunteer day with the California State Parks Foundation (CSPF) brought us back to China Camp State Park in Marin County. Anchor volunteers had travelled to this same park in 2013 to help paint a water tower and build fencing. 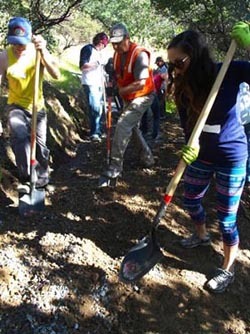 This time around we exchanged the paint brushes for shovels and pickaxes to get down and dirty on some hardy trail maintenance. Included in the list of hilly state parks in California is China Camp, which is a popular spot for mountain biking enthusiasts. It is the job of CSPF to ensure that these beautiful trails stay bike-friendly, and in turn ensure that the bikers stay trail-friendly. Our task for the day was to spread gravel along a portion of the trails and intersperse it into the dirt. This process was followed by a more delicate task of smoothing out the dug-up trail to create a pristine, flat surface. Since these particular trails see so much bike traffic, the integrated gravel will help the trails stand up to the constant flow of bike treads. Thus, the trail will stay sturdy and flat, enabling mountain bikers (and hikers) to enjoy the beautiful setting on a smooth, stable surface. Of course, having the trails remain in good condition also makes the State Park happy. Good thing Anchor volunteers were happy to help! 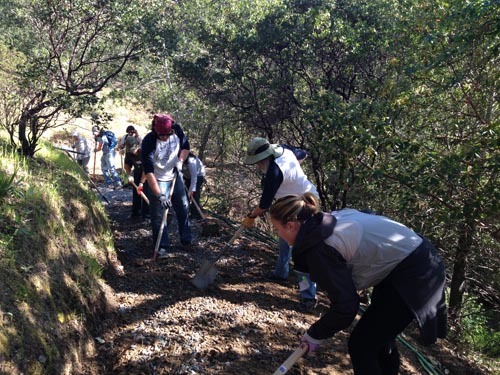 The event was the fifth volunteer day for Anchor employees in collaboration with the California State Parks Foundation. Anchor’s partnership with CSPF was launched in February, 2013 with the release of Anchor California Lager. California’s state parks system, Anchor’s history, and California’s first genuine lager were all born in the second half of the 19th century, and as a tribute to our shared history and traditions, a partnership seemed natural to us. 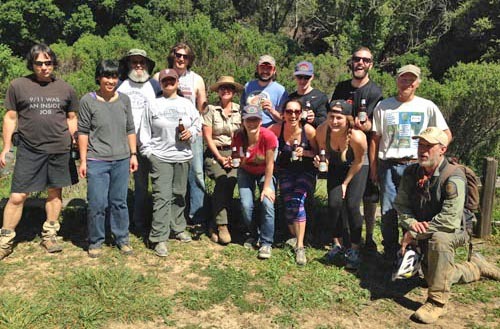 Anchor employee volunteer days in California State Parks are a result of this partnership. 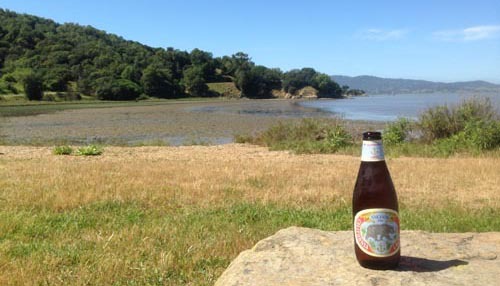 Use our Beer Finder to search for Anchor California Lager near you, and learn more about the California State Parks Foundation at www.calparks.org.